System designed to maximise the safety of the occupants (with the exception of the rear centre passenger) in the event of violent collisions. It supplements the action of the force-limiting seat belts (with the exception of the rear centre passenger). the seat belt alone is sufficient to provide optimum protection in these situations. The airbags do not operate when the ignition is switched off. This equipment will only deploy once. 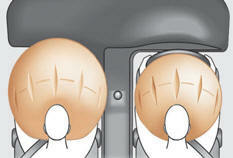 If a second impact occurs (during the same or a subsequent accident), the airbag will not be deployed again. Deployment of the airbag(s) is accompanied by a slight emission of harmless smoke and a noise, due to the activation of the pyrotechnic cartridge incorporated in the system. This smoke is not harmful, but sensitive individuals may experience slight irritation. The noise of the detonation may result in a slight loss of hearing for a short time. The airbags are deployed simultaneously, unless the passenger's front airbag is deactivated, in the event of a serious front impact to all or part of the front impact zone A , in the longitudinal centreline of the vehicle on a horizontal plane and directed from the front to the rear of the vehicle. According to version, this warning lamp comes on in the instrument panel and/or in the seat belt and passenger's front airbag warning lamps display when the ignition is on and until the airbag is reactivated. When you remove the child seat, turn the switch to the "ON" position to reactivate the airbag and so assure the safety of your front passenger in the event of an impact. With the ignition on, this warning lamp comes on in the seat belt and passenger's front airbag warning lamps display for approximately one minute, if the passenger's front airbag is activated. If this warning lamp comes on in the instrument panel, accompanied by an audible warning and a message in the screen, contact a PEUGEOT dealer or a qualified workshop to have the system checked. The airbags may no longer be deployed in the event of a serious impact. If this warning lamp fl ashes in the instrument panel and/or in the seat belt and passenger's front airbag warning lamps display, contact a PEUGEOT dealer or a qualified workshop. The passenger's front airbag may no longer be deployed in the event of a serious impact. If even one of the two airbag warning lamps comes on continuously, do not install a child seat on the front passenger seat. Have the system checked by a PEUGEOT dealer or a qualified workshop. 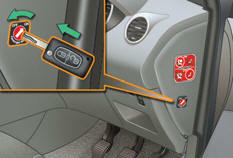 System which protects the driver's knees in the event of a serious front impact. This airbag is fitted in the dashboard below the steering column. It is deployed at the same time as the front airbags. System which protects the driver and passengers (with the exception of the rear centre passenger) in the event of a serious side impact in order to limit the risk of injury to the chest. - in the rear, in the side trim (except SW models). The lateral airbags are deployed unilaterally in the event of a serious side impact applied to all or part of the side impact zone B , perpendicular to the longitudinal centreline of the vehicle on a horizontal plane and directed from the outside towards the inside of the vehicle. 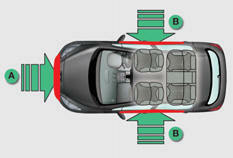 The lateral airbag inflates between the front or rear occupant of the vehicle and the corresponding door trim panel. If this warning lamp comes on in the instrument panel, accompanied by an audible signal and a message in the screen, contact a PEUGEOT dealer or a qualified workshop to have the system checked. Sit in a normal upright position. Wear a correctly adjusted seat belt. Do not leave anything between the occupants and the airbags (a child, pet, object...). This could hamper the operation of the airbags or injure the occupants. After an accident or if the vehicle has been stolen or broken into, have the airbag systems checked. Do not sit with your knees any nearer to the steering wheel than necessary. Do not fi x or attach anything to the seat backs (clothing...). This could cause injury to the chest or arms if the lateral airbag is deployed.